Calling all Catholic Bishops: is there a way to impeach this idiot? My dear Stogie - It saddens me to say this, but I'm going to have to agree with you. Whaaaat? Oh legs, say it ain't so! Adrienne, that's good. You were the one person I worried about offending when I wrote this post. But this guy is probably creating more protestants than Martin Luther every did. What part of what I said surprises you. Johnny? And - the legs are still great, but I do have to cover a few little teeny veins with a dusting of mineral makeup. It's the charitable thing to do. That you agreed with Stogie. And the legs, wheeeet wheeeew. That's my wolf whistle doll. (Bouncing my eyebrows). IMO Francis is downright scary. 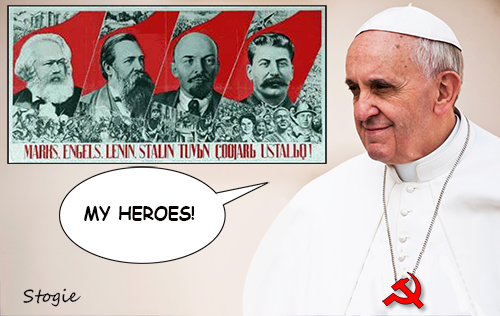 There is not teeny, tiny doubt in my mind that the higher echelons of the Church have been infested with Marxists. It started long ago, and there is plenty of indisputable proof for that allegation. Now, that doesn't mean the teachings of the Church are wrong. It simply means that we have some very bad people trying to cause mischief. And, they will cause it, because like the general population having been dumbed down, so has the average Catholic. I spent 9 years trying to teach our faith to 7th - 12th graders. Unfortunately, the lower grade teacher was a touchy-feely liberal dope, who spent those early years having the kids learn how to sing "Jesus Loves Me" and color pictures. In 9 years I only had one kid who could give me the definition of a sacrament, and that was because his mom had him memorize his catechism. I finally quit in frustration, and it was like taking my foot out of mud as the liberal happy-clappy "Catholics" swept in to make the religious education classes as meaningless as possible. And, yeah - people are leaving the Church in droves. Well, you haven't told me why that surprises you. Remember, you called me smart. Read my comment to Stogie below. I did. I was making a funny. I'll be more careful in the future. Now you're being silly........... and quirky. Wrong, it's the bass player. And I do love great legs! Noooooooooooooo! Nothing happens without the drummer! What do you expect from the Cult of Mary? Yes the drummer is the best, I being one. Lol!